WILLIAMSTOWN, Australia, March 9, 2012 (ENS) – The whale conservation group Sea Shepherd is celebrating victory as Japan ends its whaling season with less than a third of its annual self-assigned quota. The Japanese Fisheries Agency said Friday that the whaling fleet is homeward bound from the Southern Ocean “on schedule” with 266 minke whales and one fin whale. By comparison, the agency set a quota of 900 whales when the Japanese whalers began their “research” whaling in December 2011. Three vessels from the U.S.-based nonprofit Sea Shepherd have been interfering with the Japanese whalers to prevent them from killing whales since December. Watson said that Sea Shepherd ships the Steve Irwin and the Bob Barker were able to chase the Japanese whaling fleet for more than 17,000 miles, giving them little time to kill whales. 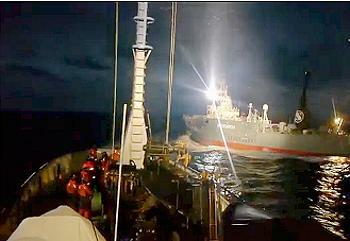 “Two of the three harpoon vessels spent more time tailing the two Sea Shepherd ships than killing whales,” he said. “Once Captain Peter Hammerstedt and his crew on the Bob Barker closed in on the Nisshin Maru on March 5th, the whaling season was effectively over for the season,” said Watson, speaking from the Steve Irwin, which is now in Williamstown, Australia for refueling. “Around 2005 JST the Bob Barker started firing more than 40 flare signals and delivering a high-power laser beam toward the YS2 and YS3. The laser delivering lasted for about 50 minutes. There were neither injuries to the Japanese crews or damage to both vessels from the Bob Barker’s attack,” the Japanese agency said. Captain Hammarstedt, 27, a veteran of numerous Sea Shepherd campaigns, avoided the Japanese fouling lines. 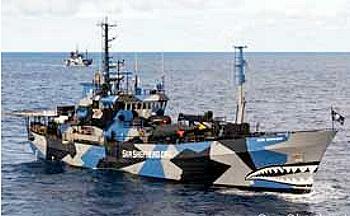 This is Sea Shepherd’s eighth straight season of anti-whaling activities in the Southern Ocean. 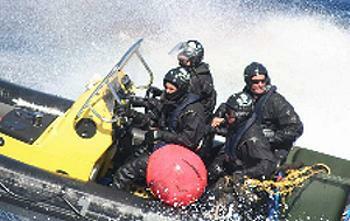 Tactics include sending activists in small inflatable boats from the larger Sea Shepherd ships to throw butyeric acid stink bombs and aim paint guns at the whaling vessels. They have used ropes to try to entangle the whalers’ propellers. The whalers have retaliated by shooting water cannon at the activists. But all that is over for the season as the Southern Ocean begins to freeze over and the whaling fleet heads back to Japan. Watson said the Japanese government security vessel Shonan Maru #2 has been spotted by fishing vessels at 30 degrees South due east of Brisbane, Australia, indicating that the vessel is well on its way to Japan. “The kill figures will not be released by Japan until April, but in my opinion they will not get over 50 percent for certain and my prediction is it will not be above 30 percent. Not as good as last season, but much better than all the previous years,” said Watson. In the 2010-2011 season, the Japanese whalers went home early after killing just 172 whales out of their self-assigned quota of 900 because of Sea Shepherd interference. In December 2012, if the Japanese whaling fleet returns to the Southern Ocean Whale Sanctuary, the Sea Shepherd Conservation Society will launch Operation Cetacean Justice with four ships, two helicopters, four UAV (drones), and 120 volunteers, Watson said Friday. Watson says that during the past seven campaigns against Japanese whalers in the Southern Ocean Whale Sanctuary, Sea Shepherd actions have saved the lives of over 2,781 whales. The Southern Ocean Whale Sanctuary is an area of 50 million square kilometers surrounding the continent of Antarctica where the International Whaling Commission, IWC, has banned commercial whaling since 1994. 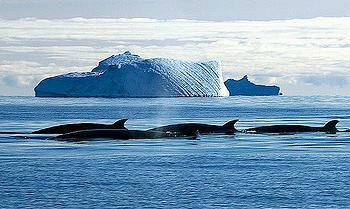 In addition, the IWC has placed a moratorium on all commercial whaling that took effect in 1986. Since 1987, Japan has continued to hunt whales, calling its whaling “perfectly legal” because it is done under a provision in the IWC charter that permits whaling for the purposes of scientific research. 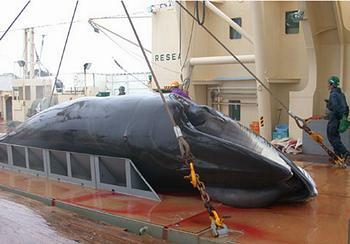 In 2010, Australia initiated legal action in the International Court of Justice in The Hague against Japan’s so-called “scientific” whaling in the Southern Ocean Sanctuary. The Japanese government now issues itself “scientific permits” to kill up to 935 minke whales and 50 endangered fin whales in the Southern Ocean Whale Sanctuary every year and up to 220 minke whales, 100 sei whales and 10 sperm whales in the North Pacific.